The Novum Instrumentum or literally the New Instrument at first may appear a strange name for the Word of God. However, we will see that it was aptly named because it was indeed the new instrument that, in God’s providence, was used to bring the Word of God to many people. In other places I have written that it was my privilege to work for a number of years with what is called the Van Kampen Collection, a collection of artifacts, manuscripts and printed editions of God’s Word that is presently located at the Scriptorium at the Holy Land Experience in Orlando, Florida. I have also stated that the book that made the greatest impact on my life was the Algonquin Bible translated by John Eliot and printed in 1661/1663 at Cambridge, Massachusetts. However, I believe that an equally strong case may be made for the Novum Instrumentum, the book under consideration in this essay. The reason for this statement is that there is good reason to believe that this book had the greatest impact of any book in the Van Kampen Collection. That, in itself, is a bold statement because the Collection includes such books at the Latin Vulgate of Johannes Gutenberg, the first edition of Calvin’s Institutes, and many other rare books. How is it possible to substantiate such a statement? I believe it is because it was through the instrumentality of the Novum Instrumentum that the Reformation of the 16th century occurred. Let us investigate the history of this book. The world of the 15th century in the West was dominated by what was called the Renaissance, an intellectual awakening that transformed history. It was a time of great advance in many areas including that of humanism. When we think of this word, we must not interpret it as equal with the secular humanism of our day because many of the humanists were religious people. Rather, it was an attempt to realize the potential that was in man. It was a time of advancement in the arts and painting, but it was also profoundly influenced by the attempt to reform society. Most people recognized that Western Society was in need of a transformation because of the many societal ills including the condition of the Church. The Humanist analysis of society’s ills was due to ignorance and the solution was education. The foregoing is a simple statement but it captures the essence of the humanist agenda. However, what was to be taught and where could such wisdom be found that had the power to change society? The Humanist answer was in the writings of the Greek and Roman philosophers who flourished many centuries before. How could their insights prove to be valuable many centuries later? It was because these philosophers were great teachers and were supremely interested in ethics or standards of behavior. Thus the program of the Humanists was to recover wisdom from the past in order to apply it to the conditions of the 15th century. They had a slogan that expressed their method of approach. It was Ad Fontes or back to the sources. Thus there was the need to study the ancient authors of both Rome and Greece. There was not a great problem in recovering and studying the writings of the Roman philosophers such as Cicero, Tacticus, and others because they wrote in the Latin language and it was still being taught and spoken. However, there was difficulty in understanding the writings of the Greek philosophers such as Plato, Aristotle, and others because knowledge of the Greek language had nearly been extinguished. To aid in the recovery of the Greek language, the Platonic Academy was established in Florence where the study of Greek was conducted with great enthusiasm. In fact, one could not be considered as having completed his education if he did not spend a period of study at the Platonic Academy. The subjects of study were the writings of the Greek philosophers as the name of the academy witnesses. However, another event occurred under the providential hand of God. The city of Constantinople, where the Patriarch of the Eastern Church was located, fell to the Turks in 1453. As a result, many of the Greek speaking members of the Eastern Church migrated to the West bringing with them manuscript copies of the New Testament. While the above events were occurring, the invention of printing by moveable type was perfected by Johannes Gutenberg of Mainz, Germany. In 1455 he produced his first book, a copy of the Latin Vulgate. It was not long before printing in other languages occurred. As an example, the first printing of a Bible in German took place in 1466, just eleven years after the printing of Gutenberg’s Bible. However, when it came to printing the Greek language, there were certain obstacles. Printers sought to produce as closely as possible printed pages that mirrored the scribe’s handwriting. This was especially difficult for Greek as the scribes often combined letters into ligatures or combination of letters that were intricate and extremely difficult to cast. However, the problems were gradually overcome and books printed in Greek began to be issued from the presses of Italian printers such as Aldus Manutius (the Aldine Press of Venice) in the early part of the 16th century. Exactly when the thought of printing the New Testament in Greek surfaced is impossible to state with certainty. However, we know that the Archbishop of Toledo, Cardinal Francisco Ximenes de Cisneros, desired a thorough reformation of the Spanish clergy under his supervision. To accomplish this he founded what came to be known as the University of Acala (Complutem in Latin) near Madrid, Spain. Part of his reforming program was to teach Greek to the Spanish priests and in order for him to do that he established a printing press in the University and by 1514 the Greek New Testament had been printed. However, it was not published because the New Testament was part of a great polyglot known as the Complutensan that was to include the Old Testament and Apocryphal books as well. News of what was taking place in Spain reached the ears of a printer by the name of Johannes Froben who has assumed control of the famed Amerbach press in Basel, Switzerland. Froben realized that a Greek New Testament would sell very well and he was anxious to have it printed and published before the Complutensan Polyglot was completed. However, he did not have anyone who was knowledgeable enough in the Greek language to edit the manuscript texts for printing. Here is where the account becomes interesting. Unknown to Froben, Erasmus, the greatest Greek scholar in Europe, had done a fresh translation of the New Testament into the Latin language and was looking for someone to print it. However, it was not easy to find such a printer because of the position that the Vulgate held in the church. It would be an act of courage, if not foolhardiness, to print a Latin translation that would differ in any way from the Vulgate. According to what we are able to determine from history, and we must admit that the details are not as clear as one could wish, Erasmus wrote to Froben asking if he would be interested in printing his Latin translation. In the end it appears that an agreement was struck between Froben and Erasmus. 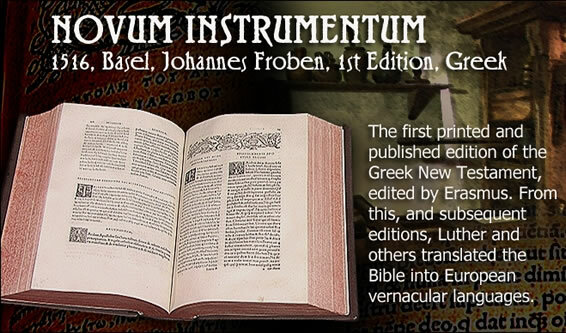 Froben would print the new Latin translation if Erasmus would agree to edit the Greek manuscripts for printing. The Novum Insrumentum was an immediate best seller. Not only was Erasmus the supreme Greek scholar in Europe; he had a flair for publicity as well. He dedicated the book to Pope Leo X and, as a result, Pope Leo X prohibited the sale of the Complutensan Polyglot for at least four years. The Old Testament portion of the Complutensan was finally finished in 1518 some four years after the printing of the New Testament. However, it was not permitted to be published or placed on sale until 1522, six years after the initial printing of the Greek New Testament by Froben. By that time, Froben’s Greek New Testament had reached its third edition. Needless to say, the editors of the Complutensan Polyglot felt aggrieved at what Erasmus had done and went so far as to accuse him of heresy because he had omitted I John 5:7 from the Novum Instrumentum although he did include it in the third edition that was published in 1522. However, that is a story for another time. In all Froben would print five editions of the Greek New Testament. They were published in 1516, 1519, 1522, 1527 and a final edition in 1535, the year before Erasmus’ death. Beginning with the second edition, they were called the Novum Testamentum or the New Testament. The work of Erasmus would be continued by Robert Stephanus, Theodore Beza, and the Elzevir brothers in Leiden. The text type originated from Constantinople and is known as the Byzantine text. However, it is best known as the Textus Receptus from a blurb that appears in the 1633 edition by the Elzevirs. It was the standard Greek text of the 16th century although modified by additional readings from other manuscripts. It is true to say that all of the major Reformation Bibles including the German, French, and English that were translated from the Greek original used the basic work of Erasmus as the source text. All of the above is a fascinating story from the 16th century and is filled with interesting details of how to capture the printing market, etc. But we began the article by stating there is good reason to believe that the Novum Instrumentum was the most influential book contained in the Van Kampen Collection. How can this statement be substantiated? It can be illustrated from the life of Martin Luther. After receiving his doctorate in theology, Luther was appointed professor of Biblical studies at Wittenberg University. However, few people are aware that Luther had received a trilingual education before he assumed that position. Luther thus had been trained in Latin, Hebrew, and Greek in order to qualify for his doctorate in theology. To prepare his lectures, Luther would study the Word of God in the original languages as well as the Latin Vulgate. It was by understanding that salvation was by grace and received by faith and not as a result of law keeping that Luther was saved. How did he understand those words in their true meaning? Luther, through the ministry of the Holy Spirit, came to understand that the act of justification was a change in his legal standing before God and was received by faith alone. It was not the moral renovation that the Latin Vulgate required of a sinner through his cooperation with God and his own works. Luther came to realize the truth of a free justification through the study of the New Testament in the original language. From that understanding of justification came the Reformation. Crucial to that true understanding of the true meaning of justification was the Greek New Testament, the Word of God in the source language. Thus we can say that the Erasmus Greek New Testament was the Novum Testamentum or the New Instrument that God used to reform His church.